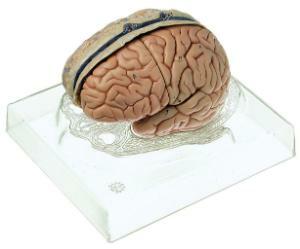 Gain a better understanding of how the dura mater envelops and cushions the brain with this combined model. The dura can be removed from the life-size brain model, which can be dissected into five parts. The right half of the brain shows the meninges and blood vessels; the left half of the brain separates into a two-part cerebrum, temporal lobes with cerebellum, and brain stem. The six-part model rests on a base featuring a diagram of a horizontally sectioned brain, and it can be removed for closer examination.